In a huge victory for the right-to-die movement, California Gov. Jerry Brown has signed into law a bill that legalizes doctor-assisted suicide for terminally ill patients in the nation’s most populous state. Brown’s action ends a yearlong saga prompted in part by the case of the late Brittany Maynard. Maynard was a California native suffering from terminal brain cancer who made national headlines last year when she moved to Oregon (the first U.S. state to legally allow physician-assisted suicide) in order to be able to end her life. Before her death at age 29 on Nov. 1, 2014, she lobbied for California and other states to legalize doctor-assisted suicide, and her family has continued to advocate for the cause. The California legislation initially stalled amid opposition from the Catholic Church and other opponents. However, it was reintroduced and passed on Sept. 11 in a special legislative session. The action in California comes at a time when Americans’ opinions on assisted suicide are changing dramatically, according to a Gallup survey conducted in May of this year. 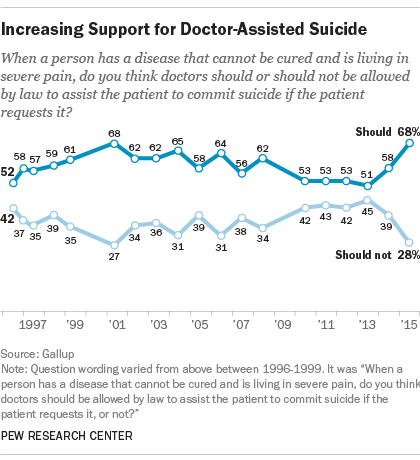 Roughly two-thirds of U.S. adults (68%) say doctors should be allowed by law to assist patients who are terminally ill and living in severe pain to commit suicide. That’s an increase of 10 percentage points in just one year, and 17 points over two years. The rise in support for legal assisted suicide has been especially dramatic among younger adults, like Maynard. Indeed, about eight-in-ten Americans between the ages of 18 and 34 (81%) favor such laws, a rise from 62% in a 2014 Gallup survey. 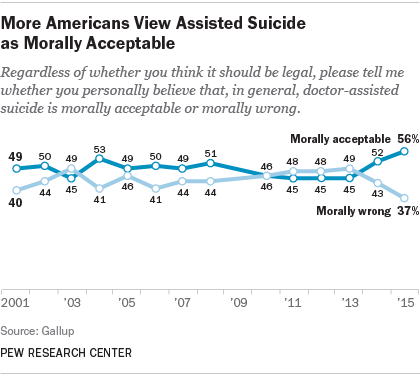 Gallup also has found that an increasing share of Americans say doctor-assisted suicide, in general, is morally acceptable. In 2015, 56% say it is morally OK, up from 45% two years prior. Pew Research Center most recently asked Americans about their views on end-of-life medical issues – including whether a person has a moral right to end his or her own life in certain circumstances – in 2013. Most Americans said this moral right does exist in cases where a person has a disease that is incurable (56%) or when the person is suffering great pain and has no hope of improvement (62%); both figures have increased in recent decades. 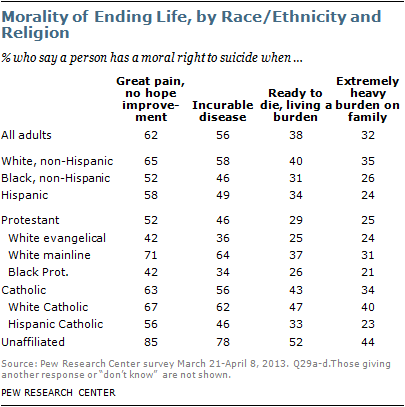 In both cases, religiously unaffiliated Americans (atheists, agnostics and those with no particular religion) were roughly twice as likely as white evangelical Protestants and black Protestants to say that people in those situations have a moral right to suicide. With Brown’s signature, California becomes one of five states to allow doctor-assisted suicide, joining Oregon, Washington, Montana and Vermont. The New Mexico Supreme Court is scheduled to hear arguments on the issue later this month. Other countries also allow assisted suicide. Earlier this year, for instance, Canada’s Supreme Court ruled that all Canadians have a right to doctor-assisted suicide. The Netherlands, Switzerland, Belgium and Luxembourg are among the other nations that allow assisted dying in some form. The issue also has been debated in Germany and France. British lawmakers, meanwhile, recently voted against proposals that would have legalized assisted dying in England and Wales.